These are wonderful original folk art panels in original paint. I would estimate a date of early 1800s however they could be earlier. These are NOT reproduction. Each panel is wonderfully naive with good original colour and detail. I was told originally that the 'Pig killing' pic was said to be November and that there must have been 12 in all, each one representing a different month. 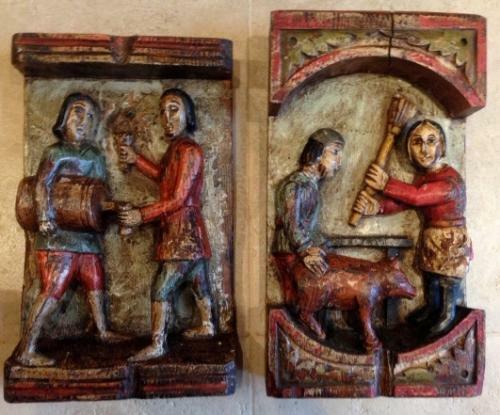 We don't know the month for the other panel which depicts pouring of Ale or Cider. We think that they came from an old Inn or Ale house and formed part of the building's decoration. The panels don't quite match in size. One has a slight split at the top which could be expected however they are in very good condition for their age and equally important still retain much of their original paint which suggests to me that perhaps that they were on the inside of a building rather than the outside.